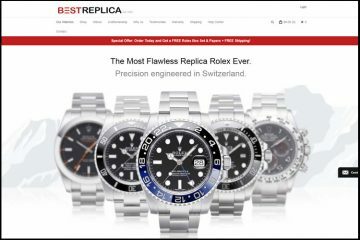 Fakeswisswatches.com is a very pleasant online replica watches store. 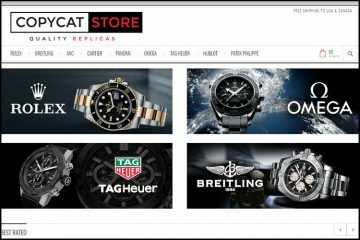 It has a very pleasant and friendly design that invites you to browse its collection and discover some of the most beautiful fake watches launched by the original brands. The website has a very simple design with just a few embellishments. The color scheme is white and red; there are four quite appealing sliding banners and two elegant menus- one at the top and one in the left side of the page. The whole store is very easy to use and modern. Both menus are used to display the available brands. 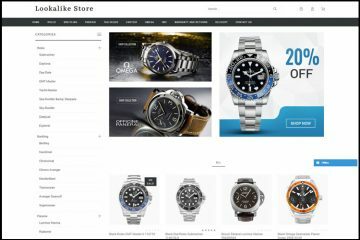 The upper menu lists the most popular brands such as Rolex, Omega, Breitling, Tag Heuer and IWC while the left side menu bar features all the watch designers offered by this company. The list is very long and it mentions all the important brands in the world. Once your cursor rolls over one of these brands, a list with the sub-categories unfolds allowing you to start browsing for the desired model. Once you click on one of the brands you see an advanced search option in the left on the screen. Here you can choose the desired criteria: the collection and the price range. I find this filter very useful. It helps you narrow down your search and eases the process of locating the most suitable replica. The product description page is very detailed and it presents all the important information regarding the quality and accuracy of these fake watches. The prices are quite affordable, but all of them are listed in GBP. Even though the company is called FakeSwissWatches.com, it carries both Swiss and Japanese movement watches. The replica watches equipped with an automatic Japanese movement cost about 90-200 GBP while the replica watches equipped with a Swiss automatic movement cost about 200-500 GBP. The fake watches have some of the most high clarity and detailed photos I have seen. Each product has about five good quality images that show the dial, the buttons, the caseback, the bracelet and the band. There are even close-ups for the most important parts of the knockoffs. These photos are very good and accurate previews of the quality offered by this replica watches merchant. The company accepts the following payment options: Visa and Mastercard. I always say that these are the most recommended payment options for Internet orders and my opinion is that only the most reputable and stable replica watches company are able to offer both of them. FakeSwissWatches.com ships packages worldwide with Express Mail Service and the delivery takes about 5-7 business days. Furthermore, delivery to any country in the world is free of charge. This means that when you order on this online site you enjoy free delivery. All orders are dispatched with a tracking number that is sent to you by email when the package ships out. It seems that all orders can be returned if the customer requests this. So if you are not completely satisfied with your products do not hesitate to contact customer service and request the return details. Additionally, the return costs need to be paid by the customer and a restocking fee of $100 or 20% of the value of the order will be charged for all returns. 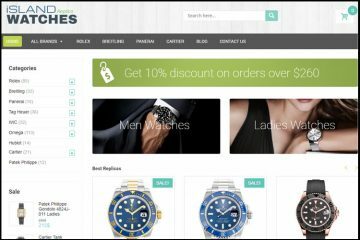 This fake watches online store offers customer service by email. For any inquiries you might have regarding their products, services or policies simply send an email and their friendly customer service will gladly answer your questions. FakeSwissWatches.com is a source of good quality Japanese and Swiss replica watches at very affordable prices. The company offers free world wide delivery by express mail, accepts Visa and Mastercard payments and has a return policy. 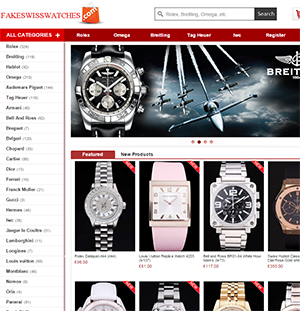 It seems to be like a very good place for ordering fake watches.